Includes bibliographical references (p 17-20). 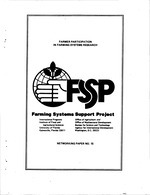 "Discussion paper prepared for the 17th meeting of the Asian Farming Systems Working Group, Oct. 6-11, 1986, held at IRRI, Philippines." D.L. Galt and S.B. Mathema. Discussion paper prepared for the 17th meeting of the Asian Farming Systems Working Group, Oct. 6-11, 1986, held at IRRI, Philippines. The authors are, respectively, Socio-economist, Department of Agriculture (DOA)/Agricultural Research and Production Project (ARPP), and Chief, Socio-Economic Research and Extension Division (SERED), DOA, Ministry of Agriculture (MOA). Kathmandu, Nepal. As the practice of farming systems research (FSR) continues to evolve and mature, farmers' constraints, problems, decision-making criteria, risk averseness, and opinions are being taken into consideration to a greater and greater degree (Chambers and Ghildyal, 1985; Chambers and Jiggins, 1985; Fresco and Poats, 1986; Richards, 1985). Part of the growing awareness that farmers should be allied as partners with both extensionists and researchers has been due to a natural realization that technically-proposed solutions to farmers' existing crop and livestock systems did not improve the situation of the farm household -- especially the women decision-makers (Fresco and Poats, 1986), or were alternatives which were totally unacceptable to farmers from the beginning (Chambers and Jiggins, 1985; Richards, 1985). In addition, other social scientists began to complement the work begun by agricultural economists. Especially active have been anthropologists and rural sociologists in the analysis of household and village-level economic, social, cultural and religious situations, norms, taboos, practices and beliefs (Fresco and Poats), and in the consideration of nutritional constraints and traditions (Frankenburger, 1984). (Chambers and Ghildyal, 1985; Rhoades and Booth, 1982; Rhoades and Potts, 1985; Richards, 1985). Various approaches to include farmers as partners in research and extension are evolving world-wide. Some of them include (1) the "farmer-back-to-farmer" approach (Rhoades and Booth, 1982; Rhoades and Potts, 1985), (2) the "farmer-first-and-last" approach (Chambers, 1983; Chambers and Ghildyal, 1985), and (3) the indigenous (i.e., grass roots) agricultural revolution approach (Richards, 1985). All these evolutionary approaches have in common the ability to elevate the actual farmer crop and/or livestock decision-makers to full partners in the Farming Systems Research and Extension (FSR&E) process. Where women constitue the major decision-makers in the component of the farm system in which interventions are proposed, their opinions and suggestions are actively solicited (Fresco and Poats, 1986). Where village-level decision-making is the norm or cannot be avoided, village leaders and other key informants must be brought into the systems intervention process (Bell, 1986; Fresco and Poats, 1986; Mathema and Van Der Veen, 1978; Mathema and Van Der Veen, 1980). questions concerning the trend of including farmers as partners in the research-extension process. While some attempt is made to answer these questions, the answers are very incomplete and are meant to stimulate much more thought and discussion. Given the varied conditions throughout Asia and between Asia and the rest of the world, concensus is neither sought nor possible. However, what FSR aproaches need. in general, is shorter and more cost-effective methods for including farmers as co-participants in the research and extension processes (Chambers, 1981; Chambers and Jiggins, 1985; Conway, 1985; Galt, 1985; Hildebrand, 1981; Hildebrand, 1985; McKee, 1984; Rhoades, 1982; Tripp, 1986; Wotowiec, et dl., 1986). The paper closes by providing a casekstudy in Cropping Systems Research (CSR) and FSR in Nepal since 1977. The following are just a few of the questions that researchers and extension workers ask about more intense relationships with farmers. Many others could and should also be asked. Other answers than those included here are correct, especially given the multitude if differing agricultural practices, agro-climatic realities, institutional arrangements, trained man-power availability for research and extension, and social, economic, cultural and religious aspects of societies. Some of our "correct" answers may be absolutely incorrect under other conditions or settings. 1. Why the increased interest in involving farmers more in research decision-making? f. residing in or near villages or communities relatively well supplied with different types of infrastructure (i.e., roads, telecommunication). While there are exceptions to each of these items which characterize those most affected by the green revolution, there is no doubt that they do describe the majority of green revolution beneficiaries. serving this group of farmers, most of us reply that the rest of the farming population is subject to different and adverse conditions. While most of us agree with such an answer, few of us agree as to its solution. Most researchers divide into two groups, dominated by their conceptual frameworks. The first group contends that research and extension must proceed in traditional ways, including a high degree of dependence upon high levels of petrochemical inputs to complement improved cultivars or livestock breeds. Meanwhile, this group insists that the institutional setting differences which face these farmers left behind must be changed by policy-makers at national levels before any of their research technologies will be appropriate for these disenfranchised groups of farmers. approach is needed to address the immediate concerns of these farmers. This group led in the evolution of the FSR approach. It assumes that, in many (some would say most) situations, macro policy-makers cannot (or do not have the interest to) change those institutional conditions under which these groups of farmers opperate. This group assumes that macro-political institutional conditions are exogenous in the short run, so what can be done to improve farmers' existing conditions? institutes (IARCs) and country programs have realized that no matter how institutional barriers are manipulated, the given elevation, average number of degree-days, maximum and minimum temperatures, slope, aspect, average and varied seasonal rainfall patterns, soil texture and fertility, existing and natural vegetation, and degree of male-female participation in different crop and livestock components of any given agricultural system are not about to change quickly. Since these factors determine, to a very great degree, the acceptability of any given agricultural technology, this group feels that research must be conducted under the same, or at least very similar, conditions. The key to such research and eventual dissemination of relevant technologies is the identification of relatively large homogeneous groups of target farmers, where "homogenous" may be defined as agro-biotic, agro-climatic, geopolitical, or culturo-ethnic, among others (Tripp, 1986; Wotowiec, et al., 1986). 2. How can-researchers, extension workers, and farmers be eciual partners? -- farmers are uneducated! While there are many illiterate farmers in the world, there are very few indeed who could be classified as uneducated. If we narrowly define "education" as formal training, the answer is, "yes, many farmers may be uneducated". If, however, we define "education" as "the acquired and experiential ability to understand a given agroclimatic situation well enough to survive from year to year under harsh environmental conditions and declining soil fertility; feeding a family near, at, or sometimes, below, the subsistence level year after year; working eight to fourteen hours a day; and, often, seeking offfarm employment just to make ends meet", then most farmers are quite "educated". 0.6 ha. of mixed rainfed and irrigated land? Or the Honduran farm family of seven, renting 1.8 ha. of truely miserable soil, located on a 60% slope with no terraces? Or the Botswanan farmer, trying to raise a family of five on a rainfed, single-cropped system of [maize + sorghum + melon], when rainfall In a "very good" year consists of 400 mm spread over seven or eight months? If the ability to survive under conditions typified by these examples counts for anything, farmers are definitely not uneducated. Hence, researchers, extension workers and farmers can always learn from one another by interacting and coming to a point where they all agree on making research worthwhile and relevant to these types of prevailing conditions. 3. Do farmers really perform research? Definitely. Before organized research or extension existed, farmers were performing research in their fields and in their herds. All early breeding work, which took place before the era of Gregor Mendel, was carried out by'farmers. Even by 1974, when Cornell University had been breeding apple varieties for about 100 years, 94% of the apples produced by commercial growers in the state of New York were farmer-developed varieties (MurphyI personal communication, 1974). Similarly, in the state of California, most of the commercial clingstone peach varieties used for canning are farmer-produced varieties (Fenton, personal communication, 1982). without knowing anything about the characteristics of the crop. Nepali agricultural farms and stations-lag behind the farmers in testing and recognizing the same varieties that farmers are already cultivating. Farmers do research. Organized research and extension exist to make these traditional farmer research processes more efficient, not to usurp all farmer initiative in these areas. 4. What can researchers learn from farmers?. f. Farmer field innovations, which researchers and extension workers may be able to multiply throughout the area (the PAC example from eastern Nepal), or transfer to another similar agro-clirnatic area, with or without minor adaptations, such as has been done by adding peanut after rice in Northeast Thailand through Khon Kaen University's Farming Systems Research Project (Patanothai, 1985). 5. Can extension do its job efficiently if it takes the time to learn from farmers? efficiently if it takes full advantage of farmers, especially groups of farmers, to assist with the technology multiplication and dissemination phases. Nothing is more successful than neighbor-toneighbor or relative-to-relative transfer of technology (Hildebrand, 1985; Hildebrand, 1986). In fact, this is the key point of farmermanaged trials, supervised by research and extension. When neighbors and/or relatives of farmers with trials become convinced that the circumstances facing them are the same (that the technology has not simply been "given" to someone; that their major agro-climatic and socio-economic conditions are approximately the same), and they see that the benefits to the host farm family outweigh the costs, adoption of the innovation by these other farm families is generally quick (Bell, 1986; Fresco and Poats, 1986; Hildebrand, 1985). One of the major roles of organized extension is to facilitate the multiplication of these types of verification, demonstration, or production block trials in concert with research and farmers. 6. Is it enough to involve farmer participation in design of trial interventions? (Chambers, 1981; Chambers and Ghildyal, 1985; Chambers and Jiggins, 1985; Conway, 1985; Galt, 1985; Rhoades and Booth, 1982; Rhoades and Potts, 1985; Richards, 1985). b. Enough time and manpower to carry out the necessary farmerresearcher-extension contacts. The first can usually be accomplished by facilitating visits to farms, and interactions with farmers, by researchers and agricultural policymakers in their own country, region or even village. Furthermore, extension workers can be taught to view farmers as partners in the agricultural development process, not only as clients to fill contact quotas, or recalcitrant students needing to be lectured to or taught lessons. The second need may be addressed in a variety of ways. One of the most effective is by means of directly including more agricultural economists, anthropologists and rural sociologists in national agricultural research and extension programs. While some national institutions may have difficulties with this concept at first, the dividends that usually arise from having social scientists supplement, and work jointly with, biological scientists in farmers' fields generally override traditional institutional separation of the social from the biological scientists. important? Must it be at the individual, group, village, or higher political sub-unit level? The answer to this question, perhaps more than any other yet posed, depends on the situation prevalent in a given country and society. In countries such as the U.S.S.R., the state does most of the agricultural planning and decision-making. In others, such as the People's Repulic of China, agreement on agricultural producion must be reached at the block or cell level. At the other extreme, in some countries, such as the U.S.A., it is rare for farmers to reach joint agreement on anything. Most nation's farmers find themselves between these political extremes. There are many examples of countries where group and/or village cooperation and joint decisions are required (Bell, 1986; Fresco and Poats, 1986). In Nepal, Village Panchayats (governing bodies) consist of nine wards, each of which elects a chairman and four ward representatives. The Panchayat itself is lead by the Pradhan Panch, who is assisted by a vice Pradhan Panch. Theoretically, six villagelevel organizations, one of which is a farmers' organization, also exist. Thus, to implement effective research in a given target area or Panchayat, these village-level decision-makers must be notified and included in all planning processes. These leaders must also agree upon the objectives of any field research effort. number of farmers, facing relatively homogeneous conditions, must be in agreement with the objectives of any research/extension effort, or very little progress can be made. The number of full collaborative farm households should never begin at less than ten per homogeneous target group, and should grow rapidly to a much larger number as time passes. 8. Do all levels of household decision-making need to be monitored? How often should such monitoring occur? household transactions should be monitored for at least one year on a daily basis (daily budgeting). However, for this to occur successfully, the requirements of data quality, analytical capacity, and manpower needs are presently beyond the capabilities of most country's national programs. While linear programming will be more common in the future (i.e., IRRI's cropping system sites in Central Luzon, Philippines), most national research programs today must make do with less complete monitoring techniques and less sophisticated models deriving therefrom (KSU FSR Symposium, Oct., 1985: evening session on socio-economic analytical methods). The objectives of the use of the data determine the freqiuency and intensity of monitoring. and/or the methods used to obtain the farm- or village-level data. Farm labor can be taken as an example. If the research program wishes only to avoid labor peaks when introducing their new, innovative technology, a key informant survey in the target area is sufficient to determine when these peak labor times occur. However, if the research program requires more specific information about labor use (such as the distribution of crop/livestock labor activities among males, females, the elderly and children within the household or village), there is no substitute for either several representative farmer group meetings or the maintenance of farm records on a statistically representative sample of farm households (10-40, depending on the relative homogeneity of the agricultural system and the agro-climatic setting). Not all household decisions must be monitored, especially as an FSR effort first begins In a new target area. Instead, FSR programs should go slowly and add socio-economic monitoring at a more detailed level as the need arises and only when no other alternative exists for obtaining the information more rapidly or more efficiently. Both the collection and analysis of farm-level socio-economic data are time- and manpower-consuming activities (Delobel, 1986; Delobel and Shrestha, 1985; Galt, 1985). To date, several national approaches to FSR have floundered around on the over-collection of socio-economic data and the under-implementation of systemat 'ic farm-level trials. Socio-economic data collection must complement, not lead, FSR&E approaches (Galt, 1985). innovative in the collection of socio-economic data. National programs must be more aggressive in encouraging selected graduate students from their agricultural universities and colleges to pursue thesis topics with farm household foci, with the support and collaboration of the national research scientists. National graduate students can be an excellent source of manpower to obtain the detailed data required' for more and more sophisticated understanding of the socio-culturo-economic conditions facing farm households. This potential resource currently is vastly underutilized. 9. What is the refined role of research in the new farmerresearcher-extens ion relationship? efficient utilization of their new technological innovations by farmers, if they add to their techniques of technology evaluation those important constraints facing major systems components of important, homogeneous farmer target groups. Take plant breeding as an example. Breeders should encourage earlier farm-level testing of new cultivars in their breeding pipelines before official varietal release. To do this efficiently, breeders need practical methodological suggestions to assist them to tailor their breeding pipeline to the diverse needs of different groups of farmer clients (Buhr and Galt, forthcoming). Researchers should also view both extension workers and farmers as equal partners in the technology development and dissemination process. Researchers must consider how extension workers can multiply their individual research efforts, making their efforts reach many more farms on a trial basis. For this to occur more efficiently, extension workers should be included more frequently in training courses tailored to answer such questions as, "why are trials replicated?" "what are the objectives of these trials?" "why are we measuring plant height and days to maturity?" etc. All too often, extension workers are simply told to set out a certain number of trials, to "guard them with their lives", to take harvest data, and then to send results back to a research program. What is in this process for them? Does such an approach make them feel like coprofessionals? Hardly. Finally, researchers must realize that farmers have been performing research in their fields, herds and homes long before formal research programs were funded at the national level. 10. What is the refined role of extension in the-new farmerresearcher-extension relationship? in any given national research and extension program. Seldom are extension workers involved in farm-level trial design, even if they will be the ones asked to carry out trial implementation and analysis (FSR Training Workshop, The Gambia, May, 1985). More serious and widespread is the fact that extension workers may aever have received from research any innovative technology which offered the farmers in his or her district a real improvement over local practices or varieties. c. Offer to act as partners in the testing and verification of new technology with farmers in these same extension areas. Everyone stands to gain from such a change in approach. same, food commodities and/or livestock products to the export list. Options (1) and (3) improve the national balance-of-payments situation, while option (2) cannot help but improve the internal political situation while averting starvation. d. The economics of farmers' use of inorganic fertilizer (Mathema, et al., 1981); and so on. The main tools employed by the socio-economic group have been key informant and baseline surveys, sometimes alone and sometimes in tandem. An additional tool used has been the intensive monitoring of farm household practices on approximately four carefully-selected, representative farms per cropping systems site (Mathema and Van Der Veen, n.d.). These tools were used first by the socio-economic unit of the Integrated Cereals Project (ICP) of the Cropping Systems Program (CSP), from 1977 to 1985, and later by the Agricultural Research and Production Project (ARPP) in the Socio-Economic Research and Extension Division (SERED) of the Department of Agriculture (DOA), from 1985 to the present. SERED will work closely with another new division, Farming Systems Research and Development Division (FSR&DD), in some old, and some new, FSR sites. (3) the French Technical Assistance (FTA) to Nepal. While each focus has developed a different approach to farm household interactions, all have approached the recerntly-created SERED to urge closer collaboration between their approaches to socio-economic surveying and farmer involvement in FSR, and that evolving in SERED (First Annual Meeting of FSR Groups of Nepal, August, 1986). In order to work toward this goal, a methodological concensus meeting between SRRED, PAC, LAC and FTA is being planned for the fourth quarter of 1986. The FSR approaches of both PAC and LAC are funded by British Overseas Technical Assistance (OTA). Both approaches are centered around activities at their respective research stations at Pakhribas and Lumle, but now depend to a greater degree upon extensive research trials in farmers' fields in their respective target areas. PAC's target area is four hill districts in the Koshi Zone of eastern Nepal (Dhankuta, Terathum, Sankhuwasabha and Bhojur); LAC's target area is 27 Village Panchayats in three districts of the Western Development Region of Nepal: Kaski, Parbat and Myagdi (Pandey, et al., 1986; Bell, 1986). Both approaches are similar and involve unique innovations in socio-economic survey methods and trial design procedures to accomodate to Nepali hill conditions. Upon arriving at a new hill research site within their target area, PAC staff undertake a "joint trek", while LAC staff undertake a "combined trek", both lasting from one week to 10 days. Regardless of the terms used, the purpose of such a working trek is to allow a multidisciplinary group of station-based researchers to interact with farmers, both on an individual and on a farmer group basis (Bell, 1986). Farmers are asked to identify their predominant agricultural systems and their major problems and constraints, as well as to offer their own Ideas as to solutions to such problems and toward potential future research actitivies. PAC and LAC staffs then return to their respective research bases, develop trials in the multidisciplinary mode designed to address these farmer-identified problems, and return to the target site for further dialog with farmers. Such dialog includes verification and/or modification discussions to reach agreement between the research team and the farmers of the site on the specific details of each proposed trial (Bell, 1986). Researchers next return to either PAC or LAC, design and plan finalized trials, accumulate the inputs necessary for their installation, and return to the trial site to implement trials with varying degrees of farmer participation (Bell, 1986). Such trials are under the overall management of a field assistant in each Village Panchayat where PAC and LAC work. Pumdi Bhumdi cropping (then farming) systems site in Kaski District, Western Development Region, Nepal (personal communication, T. Delobel, 1986). Recently, FTA has signed a new agreement with HMG/N to expand their activities into two additional districts: Gumli and Arghakhanchi in the Western Development Region (Bergeret, 1986). In Pumdi Bhumdi, the FTA linked with ICP and ARPP to undertake 12 intensive farm household case studies. Six of the collaborators are farmers with whom ICP and ARPP have been conducting farm-level research trials; six farmers are non-participants in the farm-level trials. Each group in turn is sub-divided into samples of farmers who cultivate (1) less than 1.0 ha, (2) 1.0-1.5 ha, and (3) more than 1.5 ha. Farms larger than 2.5 ha are excluded from the sample (Delobel and Shrestha, 1985). Extensive data are collected, including the detailed measurements of the sizes of each terrace (an average farmer in the Pumdi Bhumdi area has more than 100 terraces under his or her control), household purchases and sales, and details of the livestock/fodder components of each farm system (T. Delobel, 1986). In addition to the detailed household case studies, several additional studies have been conducted on various livestock species and livestock products, focusing mainly on water buffalo and cattle (milk production and sales; draft power and feeding requirements, etc.). Several problems have surfaced over the last year during the Implementation of this intensive data collection approach. Some of the most important, from the point of view of agricultural research in HMG/N, are (1) the lack of trained manpower in the field for collection of consistent socio-economic data, (2) the issue of monitoring frequency and type, and (3) the high cost of the approach (Delobel, 1986). SERED's plans for increased Interaction with farmers include the use of more rapid rural appraisal (RRA) techniques. SERED has drawn upon its own experience -(as the socio-economic group under ICP and ARPP) and the experiences of PAC, LAC and FTA in formulating joint plans with FSR&DD this year. These plans include jointly developing a flexible approach to new farming systems sites in Nepal. decision-makers (including the Pradhan Panch), and is carried out by a multidisciplinary team of socio-economists from SERED, agronomists from FSR&DD (the site coordinator and the site monitor), and Peace Corps Volunteers assigned to ARPP. Once the target site wards have been selected, a key informant survey -- KIS -- will be adapted and administered in the field. During the KIS, at least two knowledgeable farmers per target site ward are interviewed (Mathenia and Van Der Veen, n.d.), along with the Pradhan Panch and representatives of (1) cooperatives, (2) the Agricultural Development Bank, (3) the Agricultural Inputs Corporation, and (4) other relevant institutions in the target site wards (Krishna K. C. and R. B. Shrestha, personal communication, 1986). Given the short time between starting activities in the Naldun FSR site and planting winter crops in November, the KIS will only be partially analysed before the following activity: the group survey and trial design. Representatives of FSR&DD and SERED will meet to decide which pieces of information from the KIS are of most importance for summary before the group survey and trial design activity. Analysis of these pieces of information will be completed by SERED personnel, an abbreviated report prepared and circulated to the larger group to be involved in the group survey and trial design process, and a briefing/orientation meeting held to discuss the objectives of, and methods to be used during, the group survey and trial design activity. The group survey and trial design activity is the key to the FSR process. It will be used to reach concensus between researchers' goals and farmers' priorities, interests and problems. This phase will incorporate many of the excellent techniques developed by PAC and LAC, including the "combined group trek" concept and incorporation of. farmers' opinions and ideas into trial design in the field. However, the group survey and trial design phase goes beyond these approaches in one very significant way: the group survey and trial design attempts to adopt the method to practical use entirely within the HMG/N system of research and extension. Thus, while the process is initiated by joint decision-making between FSR&DD and SERED within the DOA, it will also include representatives from the Division of Livestock (DOL/AH) and the Ministry of Forestry. Furthermore, within DOA, it is expected that representatives from important winter crops in the area -- vegetables, fruit trees, wheat, and potatoes -- will participate in the group survey and trial design activity. A direct link with LAC will be requested, so that one livestock researcher will participate in the group survey and trial design who has field experience in socio-economic data collection. component of the system during the winter months, as identified by the farmers. multidisciplinary group will meet for formal trial design discussion. Brainstorming will follow the development of a list of predominant crop/livestock patterns and farmer-revealed problems and constraints. The group will then agree upon the best approach for exploratory (first stage, or FFT) farm-level trials, proceeding to outline the generalities of such trials. The next day will be spent in another group meeting with ward farmers, and their priority problems and constraints will be presented back to them, along with the senerai trial designs developed by the group to address these problems. Farmers' responses, suggestions, modifications and ideas for improving, changing, eliminating, or adding trials will be solicited and recorded. Back in Kathmandu, this multidisciplinary group will reconvene for one to two days the following week to finalize trial designs, and reach agreement on levels of inputs and the degree of researcher versus farmer trial management. FSR&DD will begin the process of obtaining the necessary supplies necessary to implement the trials, including field equipment and inputs. SERED will be responsible for reporting upon the group survey and trial design process, including any suggestions for modifying the process to improve it in the future. FSR&DD will produce the results of the Naldum Farming Systems Site Group Survey and Design Activity. c. Agreement on site monitoring needs, details, frequencies and responsible manpower. Farmer reaction and opinions will form a key component of site monitoring activities. If varietal changes are introduced anywhere in the system, consumer (farm household) tastes will verify their acceptability. Any innovation which increases labor input (such as the introduction of a food grain which requires more threshing or processing time) will be monitored closely. Finally, where women, the elderly, and/or children form integral parts of the agricultural decision-making process and are responsible for the labor in key field activities, both SERED and FSR&DD personnel will actively solicit and incorporate their views, opinions-and suggestions. (3) useful to both researchers and extension workers. Every effort will be made to fit the overall FSR/E methodology into the existing financial and manpower constraints of the DOA. Farming Systems Group Workshop, 11-13 August, DOA/HMG/N. First Farming Systems Group Workshop, 11-13 August, DOA/HMG/N. repertoire. In Public Administration and Development 1:95106.
first. Longman, Inc. New York, NY. U.S.A.
for resource-poor farmers: The farmer-first-and-last model. for resource-poor farmers: A parsimonious paradigm. University of Sussex. Brighton, England. Workshop, HMG/N, Department of Agriculture, Aug. 20-23. Group Workshop, 11-13 August, DOA/HMG/N. Pokhara, Nepal. Office of International Cooperation and Development, U.S.D.A. in Sub-Saharan Africa. Lynne Rienner Publishers, Inc. Rapid Rural Appraisal, Sept. 2-5. Khon Kaen, Thailand. Green, T., B. D. Gurung, M. B. Gurung, S. K. Khatry Chetri, and R.
The sondeo approach. In Agricultural Administration 8:423432.
extension: Helping research results solve farm problems. informant survey in five cropping systems research sites. research on Cropping Systems Program in Nepal. Mimeo. Nepal. Mathema, S. B., M. G. Van Der Veen and G. Pradhan 'Anjan'. 1981. Mathema, S. B., M. G. Van Der Veen and G. Pradhan 'Anjan'. n.d.
Division, Cropping Systems Program. Mimeo. Nepal. Mathema, S. B., M. G. Van Der Veen, G. Pradhan 'Anjan' and G. S.
Mathema, S. B., M. G. Van Der Veen, G. Pradhan 'Anjan', D. P.
under farmers' management at three cropping systems sites. Agriculture, Jan. 6-11, Rampur. Nepal. KSU Farming Systems Research and Extension Symposium. Academy of Agricultural Sciences, Oct. 9-12, Nanjing. Jiansu, People's Republic of China. and Extension. Feb. 26-Mar. 1, 1986. Gainesville, FL. Department Training Document 1982-6. Lima, Peru. Rhoades, Robert E. and Robert H. Booth. 1982. Farmer-back-tofarmer: A model for generating acceptable agricultural technology. In Agricultural Administration 11:127-137.
approach. International Potato Center. Lima, Peru. Wotowiec, Peter Jr., Susan Poats and Peter E. Hildebrand. 1986. Extension, Feb. 26-Mar. 1. Gainesville, FL. U.S.A.